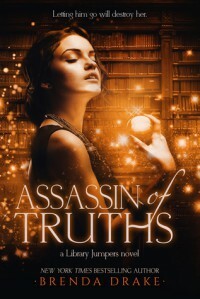 Assassin of Truths!!! - Bookish thoughts!!! This is the last book in the Library Jumpers Trilogy. I finished another series/trilogy. This is my mission this year, finishing series or at least catching up on series that are still not finished. So far I'm doing pretty good. Yay me! Summary (cause it's not that spoilery): The gateways linking the great libraries of the world don’t require a library card, but they do harbor incredible dangers. I was back in the world right from the beginning, I especially loved that we got a few reminders of what happened before. It was enough to jog my memory but not too much that it got repetetive (look at me using new words). I also loved that we gt right back into action, that's what I love about these books, they are just so action filled. I just love these characters in this story. Gia is an amazing character, the author doesn't go the route of making her a strong character by never having her cry, WHICH I LOVE. You can be strong and still show emotions. There was also some mystery about Gia and her globes, that I won't go in detail about but that I totally loved. Emily was also back, while I strongly disliked her in the second book until we figured some stuff out, I loved her in this final book. She was amazing. Like always I enjoyed every moment that had Nana, Pop and Afton in it. But also the other sentinels like Lei (my favorite ducky), Jaran (his friendship with Gia will always be my absolute favorite! ), and Demos. I still couldn't care less about Nick (I mean I feel for him, but I wasn't a big fan of him before everything went down, so) or Bastien. I'm sorry, I just can't. This is also why I read everything relating to Gia and Bastien very loosely. I can't. And Arik, ARIK. Good god, how I miss that dude from book one. Book two was a mess when it came to him. The beginning of this book, I couldn't deal with him and was very glad to see things change around the middle towards the end. I love Arik with all my heart, but damn, it's been a rough time. Another part that I truly enjoyed in this book, was seeing the fairy realm, seeing all the other havens and covens. I just love all the world building, it was beautiful and just so very well done. Overall, I truly enjoyed this trilogy. Not everything went how I wanted it to go but I can live with that, I still liked it alot.